DAY Elevator & Lift, a reputable supplier of premium quality accessibility devices in the Tri-State area of New York, New Jersey and Connecticut, offers an extensive choice of residential stair lifts. The elegant Flow II stairlift from ThyssenKrupp Access is a safe and comfortable option for any stairway configuration – straight, with corners, curved or spiral. 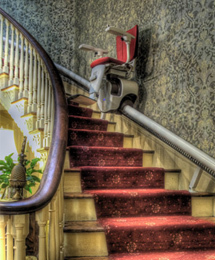 This home stair lift system can be customized to blend with any home interior. It is designed to fold away compactly when not in use, leaving the stairway unobstructed for other users. With our vast industry experience, we are well aware of the requirements of extensive clientele that includes homeowners, architects, contractors and builders. Our certified technicians can install your Flow II and also take care of inspection, maintenance and repair. DAY also witnesses or performs Category 1 and 5 testing for all models of stair lifts. For more information on the Flow II stairlift and the other mobility devices we supply, call 800-758-5438 or write to sales@dayelevator.com. Get a free solutions consultation today. Contact Day Elevator and let us elevate your lifestyle!